When Kathe Hambrick-Jackson arranged for an old school building to be moved across the Mississippi River to Donaldsonville’s River Road African American Museum, she had no idea what a treasure she had. On June 8, she is opening the doors to make sure everyone else knows. Years ago, all she knew was that the St. James Parish school board was going to tear down the Central Agricultural Schoolhouse, which was also known as the Romeville School. It was “the cornerstone for educating African American children in St. James Parish” from the 1930s to the 1960s, so she got the board to donate it to the museum in 1996. It was only after the building was placed in Donaldsonville that she realized that it was a rare Rosenwald school. In 1912, Booker T. Washington teamed up with Julius Rosenwald, the son of German-Jewish immigrants who became president of Sears, Roebuck and Co., on an innovative program to educate blacks throughout the South. Rosenwald gave construction funds for standardized schools on the condition that the local community also shouldered some of the burden, whether financially, through land donations or through labor. Over the next two decades, 5,300 schools would be built in 15 Southern states. In Louisiana, the first Rosenwald school was constructed in 1916. Almost 400 were built in Louisiana by 1932, and one in four rural black schools in the state was a Rosenwald. Only a tiny percentage of the schools still stand. Before the Donaldsonville building was determined to be a Rosenwald, there was only one known to still exist in the state — Plaisance in St. Landry Parish. A third has now been identified. “If it’s called something else, nobody knows if it received Rosenwald funds or not,” Hambrick-Jackson said. There is a concerted effort to preserve the few remaining Rosenwalds throughout the South, and to identify other abandoned structures that may be Rosenwalds. “If more people knew about the Rosenwald Project, they would have an interest in finding the old buildings that are abandoned,” as well as helping restore the ones that are known, she said. At a conference last summer in Tuskegee, much was made of the importance of the schools to the black community, and how Rosenwald was motivated to further the project because of his Jewish upbringing. 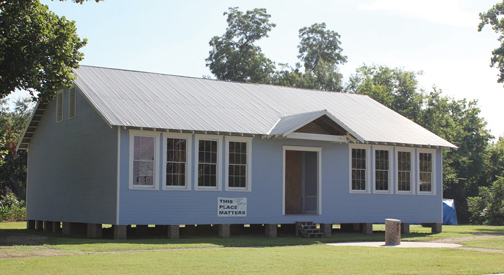 On June 8 from 2 to 5 p.m., the museum is celebrating the state’s Rosenwald Schools with an open house at the partially-restored building in Donaldsonville. It will be the first formal tour of the building for the community and the museum’s benefactors. The memorial walkway, with the first set of bricks purchased by supporters, will also be dedicated. Robin Washington Banks, great-granddaughter of Booker T. Washington, will be the guest speaker. The building, which has undergone about $500,000 in renovations, is slated to be the museum’s center for the history of black education along the River Road parishes. An attraction to Jewish history buffs, it is located just two blocks from the city’s Jewish cemetery and three blocks from the Ace Hardware store that now occupies what was Bikur Cholim Synagogue.